In the history of music Johann Sebastian Bach played such an important role that it can hardly be underestimated. But his artistry must be seen as an integral part of a larger family and thus of a certain historical tradition: for more than two centuries, the Bach family shaped musical developments in Germany, particularly in the area of Thuringia. Johann Sebastian Bach with his sons, Germany, 1730 | photo: DEA PICTURE Library; collection De Agostini "Johann Sebastian Bach belongs to a family that dedicates itself with love and skill to music, as a gift to all, and this is true for all its members, as if they had been singled out by nature itself. This much is certain, that starting with Veit Bach, the founding father of this family, all his descendants, down to the seventh generation, have dedicated themselves to the profession of music, with only a few exceptions." These are the very words – committed to the page in 1754 – with which Carl Philipp Emanuel Bach and Johann Friedrich Agricola begin their obituary of Johann Sebastian Bach. Bach, the "world famous" composer and virtuoso is, for the first time, allocated a position with a familial and historical context, one which formed the basis of his art. 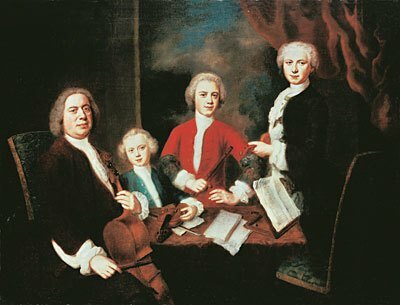 Among the great families of musicians of the 17th and 18th century, the Bach family – in number and importance of the musicians – occupies a superior position. For more than two centuries, many of Thuringia's influential musical positions were held by members of the family, at numerous locations. This influenced the cultural life of this area significantly. The impact of the Bach family extended beyond the Ernestine and Saxon principalities of Eisenach, Gotha, Meiningen and Weimar, to the baronial counties of Schwarzburg Arnstadt, Schwarzburg-Sondershausen, and Hohenlohe-Gleichen as well as to the city of Erfurt, which belonged to the territory of Electoral Mainz. This tight network included many smaller and medium-sized courts, but also churches and their affiliated schools, and finally, cities that looked after their rich musical tradition. All in all, these three types of institutions in the region were often very closely linked. The first professional musicians of the family can be traced to the end of the 16th century, its last famous representative being Wilhelm Friedrich Ernst Bach, who died in 1845. The early generations were dominated by minstrels, town pipers and simple court musicians. However, possibly from the middle of the 17th century onwards, there may be seen a continual increase in social and artistic status, marked at the outset by the first organists of the family. And by the next generation, we see family members with a university education, individuals who – beside their musical and educational qualifications – assumed the role of choirmaster. These organists and choirmasters active between 1650 and 1700 coincide with the earliest reports of compositional activity by family members. At the dawn of the 18th century, members of the family also held the highest musical positions of Court Kapellmeister and Music Director of the City: Johann Sebastian Bach was the Kapellmeister at Köthen and then "Director Musices" in Leipzig from 1717 to 1723. His cousin Johann Ludwig Bach rose in the hierarchy of the "Meininger Hofkapelle" from a simple "Musikus" to Kapellmeister. Senior musicians in various cities are found in the following generation. J.S. Bach's sons include Wilhelm Friedemann Bach, who held the Music Directorate in Halle, and his brother, Carl Philipp Emanuel, who held the same position in Hamburg. Only with the decline of court culture and a kind of institutionalized music reception in the great cities and churches at the end of the 18th century did the importance of the great Bach musical family gradually die out. If one asks about the roots of Johann Sebastian Bach's art, it is vitally necessary to look at his forefathers who composed. However, any more precise orientation is not easy, because many of these figures have already become occluded in the darkness of the music history, their tracks now faint as unfavourable times moved on. The fact that we know many general facts about the musical achievements of the older Bach family is due in essence to the collecting zeal of Johann Sebastian Bach himself. His music library preserved about twenty sacred vocal works of his forefathers. This familial and historical collection was known as the "Alt-Bachisches Archiv" by the end of the late 18th century. The originals, formerly held in the library of the "Sing-Akademie" in Berlin, went missing since towards the end of the Second World War. But over 50 years later they turned up again, in 1999, in the State Archive of the Ukraine in Kiev. In the meantime, they have been returned to Berlin. In general terms, this archive consists of around 200 small, brittle and yellowed pages of sheet music, littered with intricately ornate characters. For Johann Sebastian Bach, these pieces were certainly more than mere family history; they apparently helped him to determine his own historical and artistic position. He measured his skills against them, and saw his music as part of a longer tradition of which he was also a member. Bach took the pieces of his ancestors, works that had long since lost their value in terms of repertoire and which could now only be accorded familial and cultural or historical value, and lovingly gave them new covers, corrected errors in the original scores, and added words to incomplete text underlay. And yes, he even prepared new performance materials, daring others to hear these "old" works in various Leipzig churches. "A certain perfection displayed by our Court Composer"
Bach's own works are firmly rooted in the musical traditions of his forefathers. At the same time, an urge to go beyond the borders of the Central German style is already noticeable, and this opened up new areas of expression in the earliest preserved compositions. If one attempts today to form a clear picture of Johann Sebastian Bach, this inevitably takes on the attributes displayed by the famous Leipzig portraits on old age by Elias Gottlob Haussmann. It is no accident that we primarily think of Bach as the Leipziger Thomas Cantor. For this very reason, his last 27 years were a coherent chapter that allows us to make some statements about the personality and creativity of the composer, ones which to some extent may at least be true. At the beginning of the Leipzig period we can make out the years when various cantatas were written, their first performances traceable almost from week to week. In later years, we know much about the major compositional projects (such as the oratorios for example, and the series of published "Clavier Exercises", as well the mono-thematic cycles of the late works). But we have details too about travels undertaken and his contact with relatives, friends and musical colleagues. A far hazier picture emerges of the various stages in the composer's life prior to his commencement of the position in Leipzig. In fact, only a few key facts about his significance are known, and only a few compositions can be fixed with any chronological certainty. His sons alluded on many occasions to the "inevitable gaps" in the biography of their father, his "adventurous habits" and "incorrigible pranks". Detailed knowledge was already missing by that time. So what the young Bach was really like remains highly uncertain. Some of the surviving documents – fairly incomplete and taken at random – indicate an impetuous musician who was raged against the social conventions of the time, and maintained a collision course with his superiors. It seemed he lived only for his art. As varied as Bach's biography is, his personal musical style remained remarkably constant. This manifests itself in a continuous and systematic rhythmic, melodic and exploration of thematic material, but also of musical form itself. The Bach biographer Johann Nikolaus Forkel spoke of a "variation on a higher plane" and its fusion of everything contrapuntal. Bach sought throughout his life for nothing less than the discovery of perfect harmony and – as part of his creative understanding – musical perfection. The artistic influence of Bach's sons, which was at its greatest towards the middle of the 18th century, defines an epoch that can hardly be divorced from the whole of German music history. The protagonists of this era followed an aesthetic agenda that valued a sense of the genuine as the highest artistic ideal. However, at the same time, they were children of an age in which the educational operated according to given patterns. Thus, the creations of these composers were essentially a dichotomy influenced by traditional connotations and a distinctive struggle to be unique. This conflict was perceived by those active in a creative field mostly in a subliminal way; the surface of the artistic consciousness was deemed to have outstripped the past. The two eldest sons, Wilhelm Friedemann Bach and Carl Philipp Emanuel, were seen during their lifetimes as the leading representative of the new age. Their works are still regarded as the paradigms of style developed by this new generation. Both felt clearly a sense of impending change in their youth, new directions which first announced themselves in an appreciation of artistic manifestation itself. The achievements of this new musical consciousness were initially not so much related to technical compositional matters, more to a highly detailed attitude towards performance practice. For music this meant that a new category had been invented, that of "good taste", its basic features detailed in numerous treatises of the time. The discovery of taste acted, then, on composition itself, which set entirely new and radically different aims: the formulation of individual and distinctive themes, the appropriate declamation of a given text, the transport of a certain affect, an expansion of the range of musical expression, to include just some areas about which a composer of this age of sensibility had to ponder. The sense of novelty and of "sensibility" manifested itself especially in instrumental music – in the piano sonata, which offered an entirely opportunity for musical logic, along with the solo concerto, and finally in the symphony, which would become the most significant form for Joseph Haydn, Wolfgang Amadeus Mozart and Ludwig van Beethoven. Largely freed from oppressive traditions, Bach's sons, especially in their mature works, sustained a musical language with which the era was to be identified for ever. is Acting Director of the Bach Archive Leipzig and teaches at the University of Leipzig. He is editor of the Bach Yearbook, General Editor of the Carl Philipp Emanuel Bach Critical Edition and a member of the editorial collegium of the New Bach Edition.